Topic: Switzerland: premium crypto destination - KYC how and why? Switzerland is cheese, chocolate, watches, the most powerful army in Europe and a very calm place in the world for money. Just over two years ago, Switzerland attracted the attention of another feature. Immediately after the crowdsale of Ethereum, it became the most sought-after jurisdiction for the business, focused on working with blockchain technology. The city of Zug is often referred to as ‘crypto-valley’. According to CoinDesk ICO Tracker, the cumulative amount of all investments in ICO for the first 6 months of 2017 exceeded $ 1 billion. A third of this amount ($ 370 million) was collected by Swiss companies. Such popularity is promoted by progressive legislation, relatively low tax rates, a developed banking infrastructure, a high level of confidentiality, and, finally, the status of a pioneer country in a good relation to crypto business. Bitcoin and other cryptocurrencies are considered in Switzerland as assets in accordance with the report of the Swiss Federal Council (paragraph 2.2.1), and therefore they are neither securities nor financial contracts, that is, derivatives (futures, options, etc. ), no property rights. Cryptocurrency activities are also governed by the provisions of the Swiss Criminal Code (Swiss Criminal Code; hereinafter referred to as “SCC”), for example, a person is responsible for money laundering using cryptocurrency in accordance with Section 305bis SCC. At the moment, the Swiss Federal Council is taking steps to develop the legal status of cryptocurrencies and the rules regulating the fintech industry in the country. Switzerland does not set special rules for holding token sales, although it requires adhering to the provisions of the law in the field of combating money laundering and terrorist financing (KYC / AML Policy). 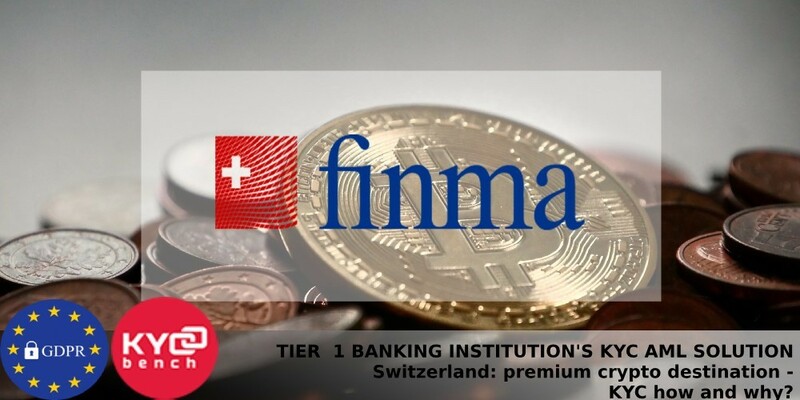 On February 16, 2018, the Swiss Financial Market Supervisory Authority, FINMA, published recommendations on how to conduct an ICO. In them, the regulator broke all the token sales into three main categories: payment tokens, utility tokens & asset tokens. Tokens sold under Payment ICO can be transferred and act as a means of payment. They must be sold under the Swiss Anti-Money Laundering Act (AMLA), but they are not considered securities, as usual cryptocurrency. This could mean that ICOs advised to use a KYC company to perform KYC on all ICO participants, which is going to be fully compliant with FINMA requirements. As FINMA’s guidelines aren’t legally binding, some companies chose an alternative option – quite risky strategy of disregarding guidelines altogether and skipping any sort of due diligence, which is not a way out. KYCBench operates in accordance with FINMA and international AML/CTF requirements and performs registration and verification at the traditional SWISS banking level at affordable cost. Personal users information is crucial for fraud and authentication management purposes, therefore its securely collected, processes and stored, as ICO 27001 and GGPR policies are in place. Using KYCBench as KYC provider for the ICO conducted in Switzerland is one of the best solutions, which performs compliance at cost effective level and same time creates good reputational image and trust of your investors.